Bookings are now closed for the In-School program. If you have questions or would like to be added to the Docs For Schools email list, contact Lesley at [email protected]. For this Docs For Schools program, films are not rated. We know that each teacher has their own style of teaching, the maturity level of students differs, and school admin and community standards differ. Because of this we supply you with a variety of links, along with the education package, to help you learn more about the films you are selecting. You will find this info in each film description below. Periodically, we will suggest a film is geared to certain grade levels. Teachers receive the films in advance to preview and, if the content is deemed inappropriate after viewing, you are free to not show the film. 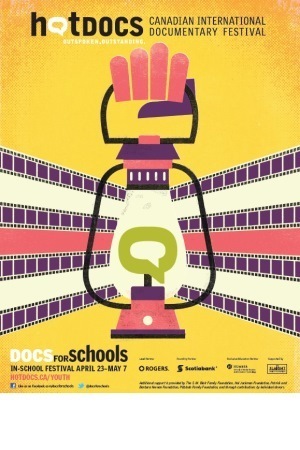 For each film requested, teachers will receive a 12x19-inch Docs For Schools In-School Festival poster (i.e. 5 films booked = 5 posters). There is blank space at the bottom of each poster to note screening info (i.e. film name, school location and time) before placing posters around the school. This intriguing documentary shuttles from New York to France to Chicago as it traces the life story of the late Vivian Maier, a career nanny whose previously unknown cache of 100,000 photographs has earned her a posthumous reputation as one of America’s most accomplished street photographers. In English, Spanish & Indonesian, with English subtitles. With the planet facing multiple environmental threats, brilliant young minds from around the world are working on innovative solutions to stave off crises in their communities. The brightest of these students have one destination in mind to showcase their work: the Intel International Science and Engineering Fair, the world’s largest high school science competition. These students represent the hope and ingenuity of a burgeoning generation; winning the competition may be their immediate goal, but changing the world for the better is the ultimate prize. Exploring artist Yayoi Kusama’s journey from a conservative upbringing in Japan to her brush with fame in America during the 1960s and concluding with the international fame she has finally achieved within the art world. A rival of Andy Warhol, Kusama battled sexism and racism in America while her hallucinations of polka dots eventually led her to the Tokyo mental institution. Without connections and speaking only broken English, she devoted herself to her one true love, making art. An animated documentary about the legendary journalist who changed the game for women in reporting before women even had the right to vote. The film also examines the boundaries between reporting and storytelling. A doc that presents and retells the virtually unknown contributions of black athletes in ice hockey. For decades, hockey was seen as a homogeneous sport - exciting to watch but played by one kind of player. Soul On Ice presents the exploits of athletes who dared to stand out, and dared to make the sport their own. The film follows two Afghan Hazara refugees, Muzafar and Khadim who were sent to Indonesia after trying to reach Australia via boat. Australia had a policy of refusing refugees arriving via sea to reach land in Australia. They were forced to the islands of Manus and Nauru, or to Indonesia where they could spend many years waiting in limbo to find refuge in other countries. Dealing with their realities, Muzafar and Khadim, they built a community and started the school which inspired a refugee education revolution. The Staging Post is about friendship, connection and the power of community. Pow wow techno pioneer Joshua DePerry, a.k.a. Classic Roots, uniquely integrates the sounds of his Anishinaabe heritage with electronic and house music. Redefining what it means to be urban and Indigenous, he’s preparing to start the next chapter of his life as an artist and educator in the world’s techno capital: Berlin. In a remote village in Afghanistan is an all-female school, founded and led by spirited humanitarian Razia Jan. In a nation where education for young women is difficult to access and the dropout numbers are high, Jan puts literacy at the forefront, encouraging the girls in their pursuit of knowledge, independence and understanding. In the midst of many complications, from the influences of the Taliban to international government forces, Jan’s school for young female students offers optimism for future generations. Profiling everyday humans with extraordinary stories, we meet three incredible women in three short docs. In NALONGO, a retired midwife now runs a clinic out of her own home in rural Uganda. In THE LAST MAMBABATOK, Apo Whang-Od is considered the world's last Mambabatok (hand-tap tattoo artist). At 99, she is passing on the tradition. In ENOUGH – The Empowered Women of Korogocho, Kenya, Beatrice teaches other local senior ladies how to defend themselves from sexual attacks which run rampant in the area. Exploring issues surrounding national identity using games and interviews, the filmmakers ask 8-11 year-olds in two Kenyan primary schools what they understand about discrimination, tribe and religion. How, when they are discriminated themselves, do they feel about their own identity? Additional support is provided by The S. M. Blair Family Foundation, Hal Jackman Foundation, Patrick and Barbara Keenan Foundation, Pitblado Family Foundation, and through contributions by individual donors.